Oh sugar, sweet, sweet sugar. There are so many ways to use you, from sweetening cakes to drinks to coating berries. Sugar is almost everywhere, even fruit naturally has sugar in it. There are many people who choose to restrict or not consume sugar - whether it is a medical reason, like diabetes, or a personal one, like wanting something less processed. Several common sugar substitutes on the market, such as agave nectar, honey, stevia, and date sugar, just to name a few. Although not all of these may be suitable for someone avoiding sugar for medical necessity. 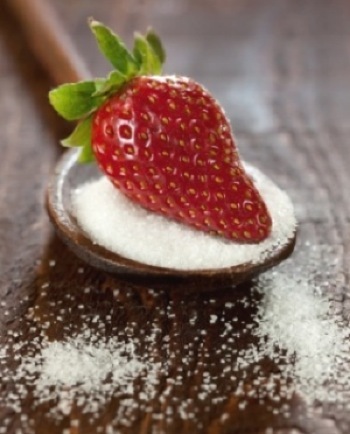 Sugar substitutes can be classified in several ways, such as natural or artificial, has calories or calorie-free, will raise blood sugar or not - there is still research on this last one. Some companies claim their products won't raise blood sugar levels, but also say that more research is being conducted to confirm this - or in other words, 'we are trying to find results to back up our statement.' If you are concerned with which sugar substitutes can or will raise your blood sugar level, you should talk to your doctor before trying them. You can buy most of these substitutes at a grocery store and use as you please, to sweeten tea or dip fruit into. You can even make your own date sugar at home, although it is not a good substitute for recipes that require sugar to be dissolved in water. As for use in recipes, there are some changes that you make when replacing sugar with a substitute. I have a substitution section that includes sugar in both cookbooks, Happy Herbivore Cookbook and Everyday Happy Herbivore. Below are a few ways to replace 1 cup of sugar in a recipe and what else needs to be done. There is a taste difference between sugar and its substitutes. Some are sweeter and some have a chemical taste - this is, of course, a personal preference. I personally find stevia appalling taste-wise. I've only tried it a few times and I really didn't care for it, but I have received emails from fans that love it. If you are looking for a sugar substitute, try a few different ones to find one that you like. If you are concerned with a sugar substitute affecting your blood sugar levels, you should talk to a doctor before trying it.